Energy from the Sun is not constant but can still be a free source of energy. The Sun’s energy is commonly converted into heat Solar Thermal or converted into electricity Photovoltaic. 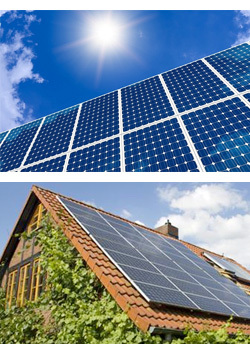 Photovoltaic is a direct way of converting Solar Energy. The energy from the Sun is converted into electricity via Solar Panels. This generated electricity is changed through an inverter from Direct current DC to Alternating Current AC. The panels can be situated off-roof (sits above the roof tiles) in-roof (forms part of the roof tile structure) or on a flat roof. Solar Thermal energy is normally generated indirectly. The energy from the Sun heats up fluid that is pumped to a cylinder to heat water that is normally heated by a boiler. It typically provides up to 70% of domestic hot water heating needs and is likely to save about 20% of consumer energy bills.